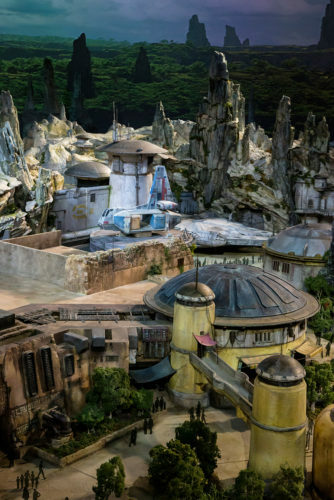 Let’s get it out of the way: it’s a mouthful to say “Star Wars-Inspired Land Model.” The colloquial way of saying it is “OMG! 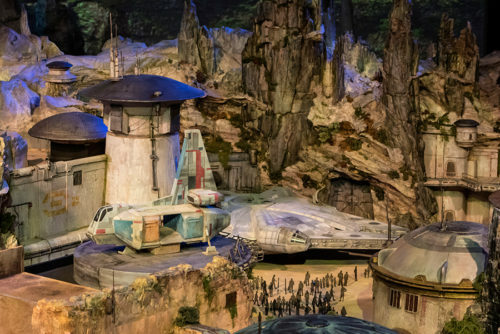 THIS IS THE STAR WARS LAND MODEL!! !” Ahead of D23 Expo, which opens tomorrow, Disney has unveiled photos of the concept model they will have on display this weekend, along with a short video that probably provides a better glimpse than we’ll be able to get through the people thronging to see it in person. 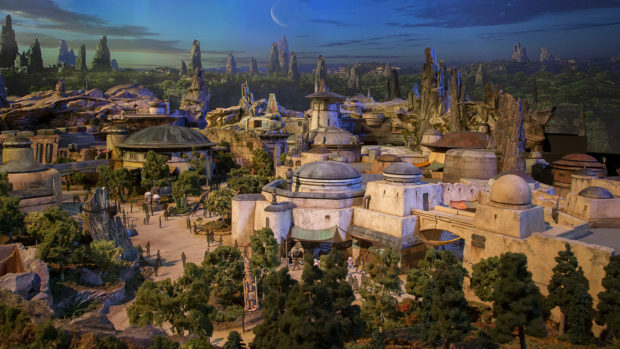 The likely reason for calling it a “Star Wars-Inspired Land” is the same reason they’re not calling the Animal Kingdom park with a planet from the movie Avatar anything near that. It’s Pandora. So what planet is this Star Wars experience set on? Maybe we’ll get to find that out this weekend. What we do know is that there will be two major experiences — piloting the Millennium Falcon, and an escape from the First Order. UPDATE: Here’s a video of the vehicle for that ride, rumored to be trackless. There’s also a very high chance that you will be able to visit a local cantina, order some blue milk, and hopefully not get into a fight with various samples of scum and villainy. We also know that two of these are being built — one in Anaheim at Disneyland and one in Orlando. Whatever Disney ends up calling it, it looks like a thing of beauty, and nowhere in that model do I see a parking garage looming in the background. I hope that it’s as immersive as walking into Cars Land, which blew me away the first time I saw it.